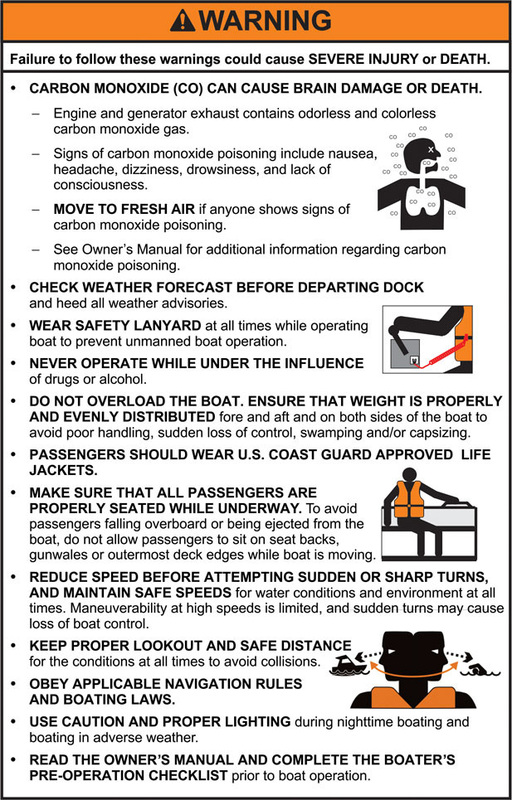 Back in May 2015, American Boat & Yacht Council, ABYC, released their consolidated boat warnings. ABYC grouped several warnings together for helm and transom warnings on specific types of boats. Earlier, we furnished a history of the development of ABYC’s consolidated warnings. Due to our specific interest in propeller safety issues, this review will focus primarily on the propeller and kill switch warnings. ABYC’s Consolidated Warnings are on the agenda at their annual Standards Week (begins 11 January 2016). We fear many attending Standards Week will be under the false impression the consolidated warnings conform to ANSI Z535.4. T-5 (ABYC’s information report on safety labels) is also on ABYC’s Standards Week agenda. We fear T-5 may be updated without addressing some of the issues relevant to the consolidated warnings. While T-5 has many problems, issues, and challenges in its current state (2002 version), it does provide a vehicle by which information for designing boat warnings could be delivered to boat builders and others in the boating industry. Before we start – We are not saying we “know it all” or that every one of our suggestions should be followed. We are saying these suggestions should be considered along with those from others to improve the consolidated warnings. While some may see us as throwing rocks at the project, we would especially like to thank American Boat and Yacht Council (ABYC) for undertaking this project and the U.S. Coast Guard for their support of the project. ABYC provided the framework and structure under which this complicated undertaking was made possible. We greatly appreciate their efforts and all who assisted them. Also a big thanks to Design Research Engineering (DRE) for all their efforts in coming up with a methodology, doing the research to find which hazards should be warned of, developing warnings and pictorial images and arranging them in a consolidated manner to take up less real estate on the boat. They also developed a procedure to test the warnings on volunteers and conducted that testing. DRE’s work was reviewed by countless entities during the development process (including us). DRE was able to work with ABYC to attempt to resolve all the issues raised along the way. ABYC and DRE stuck with the project and drove it to completion. While we may not agree with everything in the final results, we celebrate that the project was undertaken and that it was completed. Three consolidated warnings were selected to be reviewed and discussed here. Each of them have application to boat propeller safety. 1. Gas outboard open and cabin motorboat helm consolidated warning. 2. Gas outboard open motorboat helm propeller warning (danger signal word). 3. Gas outboard and open and cabin motorboat transom combined/consolidated propeller & carbon monoxide warning. We begin with a brief discussion on American National Standards Institute (ANSI) Z535.4 warning standard. This standard is widely recognized and associated with the the panel warnings (a signal word across the top such as Warning or Danger), a pictograph of the hazard, typically shown in the left panel, and a third panel including: (1) a verbal identification of the hazard, (2) a verbal description of what happens if you do not avoid the hazard, and (3) a verbal description o how to avoid the hazard. An example of an ANSI 535.4 warning from Clarion is below. Numerous mentions of ANSI Z535.4 have been made in discussions of ABYC’s new combined warning labels. Although ABYC does not specifically say the labels are ANSI Z535.4 compliant, numerous times ABYC and others refer to ANSI Z535.4 being used in their development. ANSI Z535.4 says to use mixed upper and lower case letters. All upper case is only to be used on occasion to call attention to a very important word or phrase. ABYC uses all upper case for lengthy phrases or entire sentences in most of their consolidated warnings. All upper case is much hard to read (slows down reading by those at risk and may prevent them from reading the entire warning). ANSI Z535.4 warning labels NEVER define the meaning of the signal word on the label. The meaning of “Danger” and “Warning” is described elsewhere in the standard AND typically in the instruction manuals provided by the manufacturer. However, ABYC writes, “Failure to follow these warnings could cause severe injuries or DEATH.” immediately below the Warning signal word on the gas outboard open and cabin motor boat helm warnings (vertical and horizontal format). ANSI Z535.4 does says it is fine to group multiple warnings under the same signal word when that signal word is appropriate for each individual warning. Individual warnings requiring the “Warning” signal word can be grouped with warnings requiring the “DANGER” signal word when the DANGER signal word is used. The more serious warnings are to be listed first. Grouped warnings can be individually bullet pointed (as done by ABYC in the helm WARNING text panel). ANSI also notes some industries have their own warning standards or regulations, like the boating industry has been relying on ABYC T-5. Note T-5 is currently (early January 2016) an information report, not a standard. We understand ABYC has/is considering making it a voluntary standard in the future. Discussions of how to proceed in the future: use T-5, update T-5, adopt ANSI Z535.4, try to make T-5 more compliant with ANSI Z535.4, etc have been ongoing for a few years and will be back in the limelight at ABYC’s January 2016 Standards Week. My guess is T-5 will be updated incorporating some basic features of ANSI Z535.4 and made a voluntary standard, but that is for ABYC to decide. ANSI Z535.4 says to not used “centered text” in the text panel. ANSI says to use left aligned text for everything but one line text messages. ABYC’s consolidated warnings do not appear to be centering text. However, the boating industry has a history of doing so. We also note T-5 (and its rough draft update in progress) includes several examples of warnings in which multiple lines of text in the text panel are centered. Multiple lines of centered text is harder to read and takes longer to read. We encourage those working on T-5 to specifically address the centered text issue. Our suggestions are numbered below. S1. Reduce the use of ALL CAPS. This warning has many issues. While ABYC may not agree with several issues we will raise, we at least hope they will agree the use of upper and lower case letters (as preferred by ANSI Z535.4) makes this warning much easier to read. 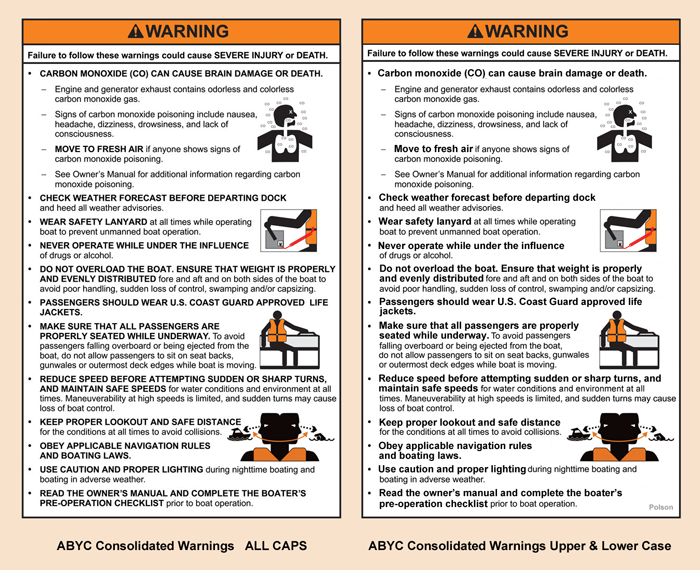 We address the ALL CAPS issue in a separate post at, ABYC Consolidated Boat Warnings: ANSI Z535.4 & ALL CAPS. The ALL CAPS version is compared with our version in the image below. Click on the image below to see a much larger version for side by side comparison. Just below the orange signal word panel “Warning”, a line says, “Failure to follow these warnings could cause SEVERE INJURY or DEATH.” That line is never seen on an ANSI Z535.4 warning. The signal word panel “Warning” just by its presence tells you there is a hazard that could result in death or serious injury. Plus it is explained in the manuals accompanying the product. ANSI Z535.4 defines things a little differently. The standard says the “Warning” identifies a hazardous situation (the industry is always a little reluctant to call anything a hazardous situation so they said “failure to follow these warnings” instead) and if you don’t avoid this hazardous situation it could result “in death or serious injury” (the industry always likes to say “serious injury” first to make their equipment look less dangerous). While boaters may not individually understand the official definitions of ANSI Z535.4, the warnings have been widely used for decades, plus why else would you be warning someone if not to prevent serious injury or death. Warnings for minor injuries use the Caution signal word. Plus minor injuries are are also addressed by instructions, training, printed materials, hands on training, common sense, etc. ANSI Z535.4 provides examples of multiple warnings of the same hazard level grouped together (like they are grouped on the consolidated warnings). 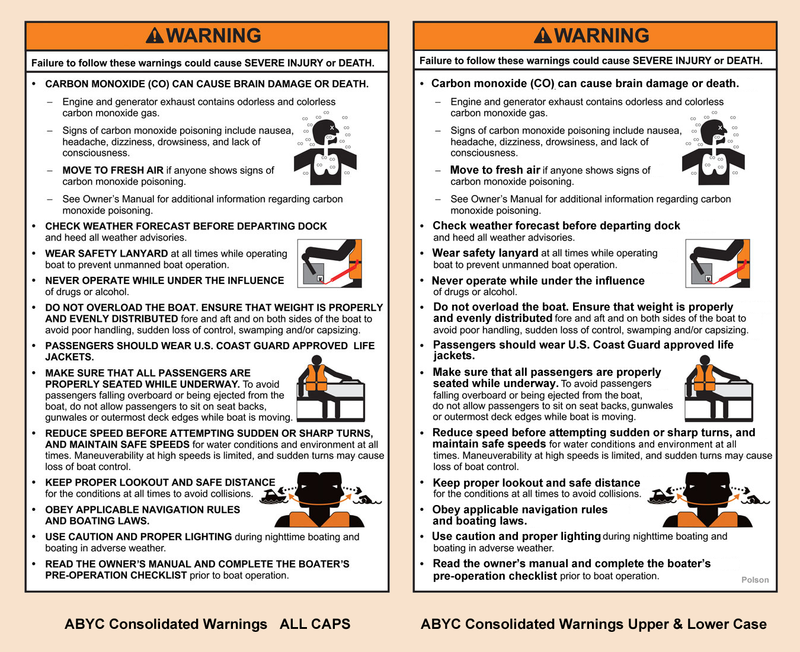 In the example most closely resembling the ABYC helm warning, a bullet point structure can be used but the bullets are to be lined up with pictorial panels for each warning. ABYC only uses four pictorials in the helm warning above. ABYC does say pictorial panels do not always have to be used, but a quick look at the helm warning above focuses your eyes on the pictorials. Those warnings without pictorials receive less attention. We suggest creating a pictorial for each bullet point that remains on this warning and placing all pictorials in a pictorial panel to the left of the text panel. We do recognize this will take additional space. As suggested later in this review, some warnings might be removed from this panel which would reduce some of the real estate (space) required. S4 List items on this combined warning OR on the boaters checklist. 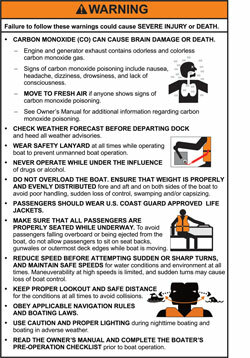 Some items on the consolidated helm warning are duplicated on the boater’s checklist. While many things are important to the safe operation of a boat, reducing the number of items on the consolidated warning would focus addition attention on those remaining. Some things like the weather forecast, obeying navigation rules and boating laws, and reading the operator’s manual might best be handled in the boater’s checklist AND/OR in the operators manual. A boat operator that has not previously read the manual, will read that warning, stop, go get the manual which is probably somewhere else, read it, then get back into the boat and take off. A boat operator not familiar with “applicable navigation rules and boating laws” will read that warning, stop, then go try to find and study those materials, then return and start the boat. Additionally, in today’s world of cell phones, we suspect being surprised by the weather is much less likely than it was in the past. People on board will be checking the weather whether you tell them to or not. While it is an important step, it is already on the boater’s checklist. It might be removed from the warning panel to allow more attention to be focused on the remaining warnings. Yes, we know cell phone service is not available everywhere, but a large percentage of boats now have the opportunity to check the weather after they depart and multiple times a day. As a result, we anticipate seeing fewer weather related accidents in future annual U.S. Coast Guard Annual Boating Statistics reports. Yes, we also know these specific warnings were identified from studies of accident frequencies using U.S. Coast Guard’s Boating Accident Report Database (BARD). We suggest in this instance, future trends may not mirror the past (weather forecasts are instantly available on the water in many/most instances). S5. Call the Safety Lanyard a “Kill Switch Lanyard”. As we pointed out before, many people do not know what “safety lanyard” refers to. For decades, boaters have called them a “kill switch” or “kill switch lanyard”. The phrase “safety lanyard” comes from the boating industry’s absolute refusal to use the phrase “kill switch” because they do not like the word “kill” associated with their product, even when it only applies to killing the engine. We previously collected dozens of phrases historically used by the industry to try to call kill switch lanyards something else. For example, A-33 (ABYC’s standard relevant to kill switches) calls them “mechanical lanyards”. At the moment, “safety lanyard” is the phrase in vogue. Design Research Engineering (DRE), consulting for ABYC on the consolidated warnings, prepared a report on the development of the labels. American Boat and Yacht Council Warning Label Grant Report. Prepared by Design Research Engineering. Robert K. Taylor and Wendy C. Sanders. Prepared for ABYC. 23 December 2014. This report shows how far they had to got to get people to understand what they were talking about when they called kill switch lanyards “safety lanyards” when testing volunteers on the consolidated warnings for comprehension. The report above includes details on how the warnings were tested (shown to individuals to determine how well they understood them). 1. On page 14 as Design Research Engineering (DRE) describes “Phase 2” of their survey used to test the labels. DRE calls says the respondents (volunteers) were shown an example of a safety lanyard or kill switch BEFORE volunteers were tested on the individual messages being conveyed by the warning. Kill Switch used by ABYC / Design Research Engineering to illustrate what a safety lanyard is. Its no wonder the volunteers understood the warning. DRE held a kill switch lanyard up in front of them, told them it was a kill switch, then asked them if they understood what “Wear safety lanyard at all times while operating boat” meant. This is ridiculous. The test was administered in Michigan, a well known boating state. Page 19 reports the level of boating experience of those surveyed. Most of those surveyed had boating experience and thus many would have already known what a kill switch was. In addition, Design Research Engineering themselves referred to what the warning calls “safety lanyards” as kill switches on pages 4,5, and 7 of their report. Call them kill switch lanyards OR test the new warning for comprehension for real (don’t show volunteers a lanyard, and don’t call it a kill switch to volunteers before asking the question) and see how volunteers do on that test. 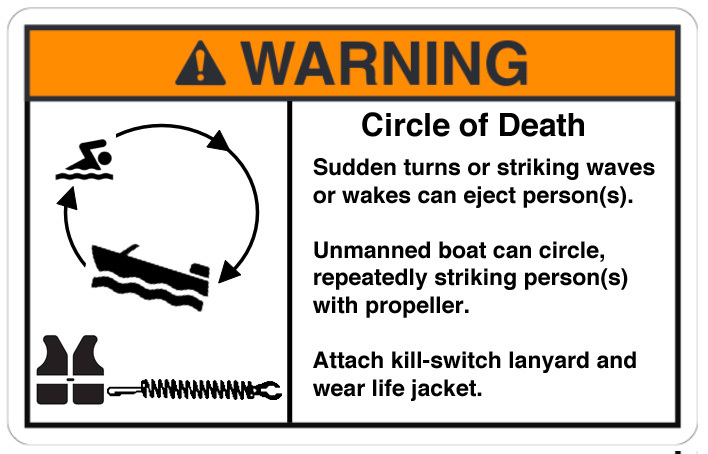 Those in the industry all knows this refers to the “Circle of Death” the tendency of many unmanned recreational boats to circle til they run out of gas, during which those in the water may be repeatedly struck by the boat and/or propeller. The warning as presented by ABYC on the consolidated warning does not even hint of this hazard. Call it the “Circle of Death” or at least describe what happens so they recognize the seriousness of the hazard and the consequences of not wearing one. ANSI Z535.4 says the warning should usually identify the hazard, the consequences of not avoiding the hazard, and how to avoid the hazard. The Safety Lanyard warning does not identify the consequences. We previously estimated kill switch lanyard wear rates at 13 to 30 percent from U.S. Coast Guard annual accident data and other evidence suggests they are much lower than that. When compared with the life jacket warning below, boat operators know the purpose of a life jacket and what can happen to you if you do not wear one (the consequences of not wearing one). Operators knowingly make the decision not to wear a life jacket. However, with kill switch lanyards, many boat operators are not aware of the consequences. Some operators do not even know lanyards exist or what they are for. Many operators choose not to use them but are not aware of the consequences (Circle of Death or boat runs off and leaves you to drown). “Unmanned boat operation (boat runs by itself without a captain)” – they actually tell them the boat runs by itself without a captain. See the image below as copied from Design Research Engineering’s report on development of the warnings. This the on the bottom half of the page used in testing comprehension of the Safety Lanyard warning. It was unfair to tell volunteer test subjects unmanned boat operation meant “boat runs by itself without a captain” then ask them what unmanned boat operation means. Plus no data is provided on how many or if any volunteers actually mentioned the Circle of Death in their response. As an example of how the hazard of “ongoing operation” could be illustrated, earlier we posted two kill switch warnings we sketched. One of those warnings is shown below. S7. Delete the word “should” from life jacket warning. The life jacket warning is “weakened” by the use of the word “should”. The life jacket warning says “Passengers should wear U.S. Coast Guard approved life jackets.” Dropping the word “should” makes the statement much more powerful. For example, “Wear a U.S. Coast Guard approved life jacket and make sure your passengers do as well.” OR “Wear a U.S. Coast Guard approved life jacket and make sure your passengers do too.”. S8. Is the life jacket warning realistic? While we agree everybody should wear a life jacket in an open motorboat when the boat is underway, we also know U.S. Coast Guard’s life jacket wear rate survey has repeatedly found only about 5 percent of adults wear life jackets in open motorboats. Warning those on board to wear a life jacket when you know 95 percent of them are not going to can devalue the other warnings. Boat operators know few adult boat operator wear life jackets. They also know boat operators without life jackets are not drowning like flies. So if there is no penalty for not following the life jacket warning, why should they pay attention to the rest of them? If you really want them to wear life jackets, you need to try something else. Yes we know that wearing a life jacket is probably the single act that would have the greatest impact on reducing annual boating fatalities. But until, life jacket wear is made mandatory OR the industry comes up with much more effective public service announcements / boating safety education, instructions to wear a life jacket might be best relegated to the boater’s checklist and the operators manual. S9. Specifically mention “ejection” in the sudden or sharp turns warning. “Reduce speed before attempting sudden or sharp turns and maintain safe speeds” warning does not mention ejection. While losing control of the boat can result in the boat capsizing or striking all kinds of objects, “ejection” is a real threat in many situation. Once the operator is ejected, the boat goes into the Circle of Death and those ejected my be repeatedly struck by the boat and/or propeller. S10. Owners Manual and Boater’s Checklist warning is not a warning. While reading the owners manual and following the boater’s pre-operation checklist are great and important things to do, they do not fit ANSI Z535.4’s definition of a warning. Not reading the manual is not a hazard in and of itself. Warnings are for specific hazards. Not following certain instructions in the manual might result in an accident. But if you want to warn about them, those hazards should be specifically listed on the warning. You are not going to injured for not reading the manual. You might be injured for not following some of the instructions in the manual. Same goes for the Boater’s Pre-Operation Checklist. Not reading that checklist is NOT a hazard. Not following some of the items on that checklist might result in injury. If specific items on that checklist should be warned against, they should be in the warnings. The Owners Manual and Boater’s Pre-Operation checklist could be handled by ending the warning, extending the label a little longer, then printing a freestanding instruction to read the operators manual and follow the Boater’s Pre Operation checklist. Or consider using a Caution or Notice signal word warning for that purpose. The current gas outboard open motor boat helm propeller warning uses the DANGER signal word and includes a pictorial. Suggested changes to the helm propeller warning above are illustrated and listed below. As with the large combined helm warning, reducing use of ALL CAPS makes the warning easier and quicker to read. Plus ANSI Z535.4 prefers use of capitalizing the first letter of the first word in the sentence, then using lower case for the remainder of the letters. Amputation of body limbs is a more specific hazard than “serious injury”. Many propeller accidents result in amputation or near amputation of limbs. 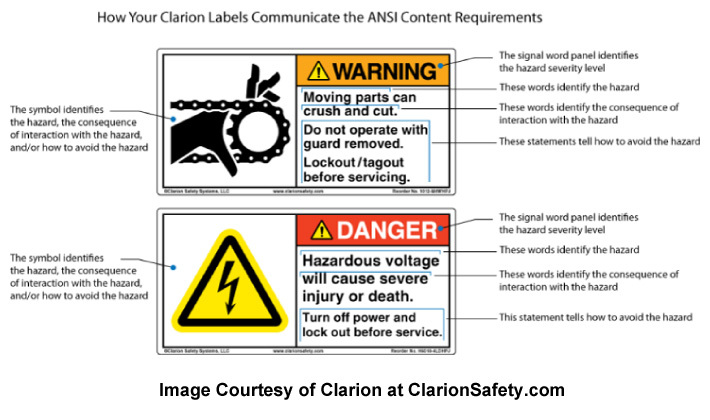 Placing the pictorial in its own panel brings the warning closer to complying with ANSI Z535.4. We recognize text size must be shrunk some (smaller font) if the same footprint is maintained (the pictorial / symbol panel takes up some space previously used by text. However, if you compare the two warnings, ABYC’s and ours, we feel our use of the hazard identification line (Rotating Propeller” and creating a pictorial panel on the left hand side makes the warning much more inviting and reduces time to comprehend the warning. If on vessel space allow, our version of the warning could be make larger to increase text size. SP3. Identify the hazard (Rotating Propeller or Spinning Propeller). The existing warning places a bullet point in front of the hazard identification. (A spinning propeller can …) and continues with bullet points in front of the two instructions of how to avoid the hazard. Bullet points should only be in front of the instructions in this instance. The hazard identification line is not “the same level” as the two ways listed to avoid the hazard. Leading (pronounced ledding) refers to the vertical space between lines of continuous text. We tried to approximate the same leading used in the existing consolidated warning between the two lines of text beginning with “Shut off engines while ..”. However ANSI Z535.4 has some guidelines that appear to recommend some more space between those two lines to improve readability. The transom warning includes a propeller warning. The primary problem with the propeller portion of this combined warning is excessive use of ALL CAPS. Use of ALL CAPS makes the warning harder to read, and requires more time to read it. Being easier to read is doubly important in this instance (there are two warnings). If one cannot read them quickly, they may not get read at all. We also suggest ABYC consider the use of a hazard identification line (such as “Rotating Propeller” suggested in our review of the helm propeller warning. We also suggest ABYC consider a more descriptive phrase for the hazard and display it in the pictograph as we did in our review of the helm propeller warning. We did not review the Carbon Monoxide warning. For example – propeller hazards on rental houseboats, pontoon boat bow riding, etc. ABYC consolidated warnings will probably prove insufficient in those situations. Additional emphasis is needed on certain points. We suggest special warnings be used in those situations. Similarly some boating applications encounter hazards not referenced on the consolidated warnings. For example, ejection and Circle of Death hazards on tilt steered outboards, Circle of Death hazard on bass boats, ejection from bass boats, bass boat outboard motors breaking off and entering the vessel after striking submerged objects, etc. We suggest special warnings be used in these situations as well. This review is among a series of posts on the ABYC Consolidated Warnings. Links to all the posts are supplied below.